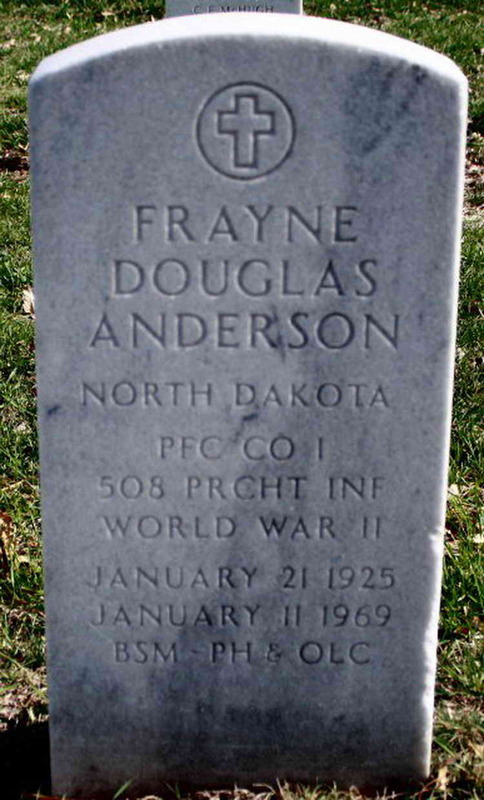 Grave marker for Frayne D. Anderson at Plot O, Site 850 in the Fort Snelling National Cemetery, Minneapolis (Hennepin County), Minnesota Frayne Douglas Anderson enlisted in the U.S. Army on 15 Oct 1943 at Fort Snelling, Minnesota. After completion of basic training he volunteered for parachutist duty and was sent to jump school, probably at Ft. Benning, GA.
With the requisite five jumps "from an aircraft in flight", Frayne pinned on his parachutist wings and soon found himself headed overseas. He was assigned to the Company 'I' of the 508th Parachute Infantry Regiment, 82nd Airborne Division. The 508th at the time was in Nottingham, England having returned from its role in the D-Day jump into Normandy and 33 days of combat in the area. Frayne joined the regiment while it was going through a process of resupply and re-staffing. More than 60% of its men had been killed, wounded or captured by the enemy. His name first appears on a roster for Company 'I' on August 31, 1944. On September 17, 1944, Frayne was with the 508th when they jumped into Holland as part of Operation Market-Garden. He was later awarded the Bronze Service Arrowhead, a bronze replica of an Indian arrowhead 1/4 inch high which denotes participation in a combat parachute jump. It is worn on the European-Africa-Middle Eastern Campaign ribbon. Frayne was wounded twice in Holland earning him the Purple Heart with one Oak Leaf Cluster. His grave marker indicates that he was also awarded the Bronze Star Medal although no official orders have yet been seen to that effect. At this time, no other mention of Frayne Anderson has been located in the records of the 508th.